The coin spoons in this exhibit are from the area which is now called Germany. 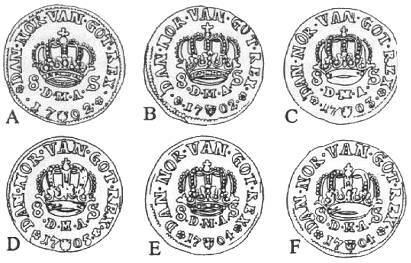 During the time period when these coins were minted, individual territories and cities minted their own coins. The coins are MUCH older than the spoons. 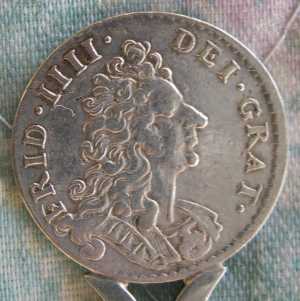 These old coins were not 'collectibles' at that time and they did not have a monetary value significantly greater than the metal content when the spoons were made. 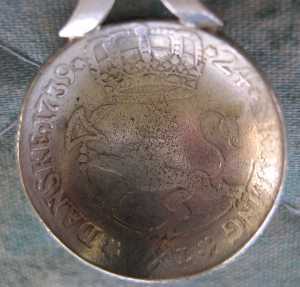 This caddy spoon has a Minerva head quality mark. It also has British import marks for 1891. Johann Georg I. Elector, 1611-1656. AR Taler (44mm, 28.97 g, 11h). Dresden mint. 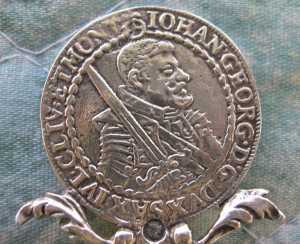 I found a number of variations of the Johan Georg 1 coin on the web. All of them are dated from the late 1590's to early 1625 era. Some of these coins bear a date and some do not. 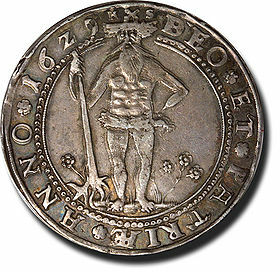 The date on this one is quite indistinct but appears to be about 1606. 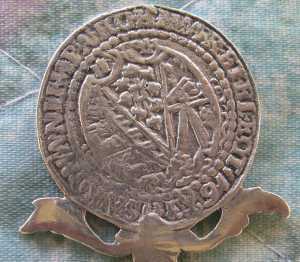 This is a picture of a better quality Saxon Taler - -but it is basically the same coin. 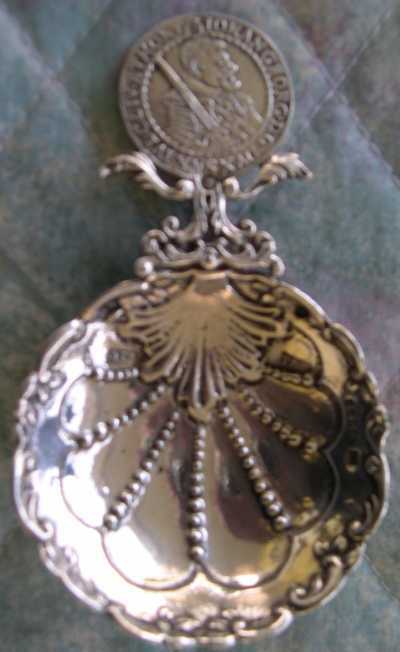 NOTE: Replicas of variations of this coin are often found on Dutch and German spoons. The replica's are of poorer quality. 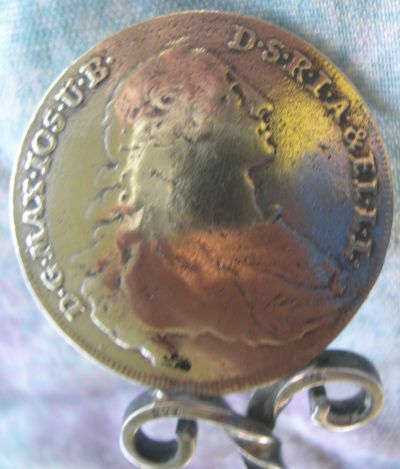 I also found a number of variations of this coin pictured on various websites. However, in this case the bowls are Bavarian 30 kreuzers and are dated 1724 and 1731. I am not sure as to why the 1731 date is after Maximilian II death. 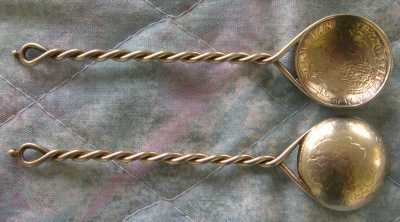 The Design is very similar to many Swiss spoons which I have seen. A number of variations of the 'wild man' taler were made for almost 100 years and some are pictured on the web. 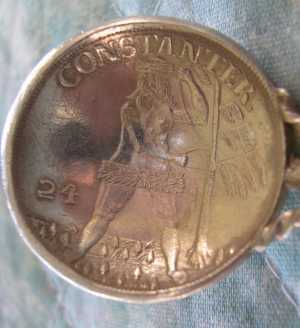 I could not find an exact picture of my variation of this coin. Both folklorists and cryptozoologists apply the term "wild men" to the European wild human. We do not know if such men actually existed at this time in history or if this was just folklore. 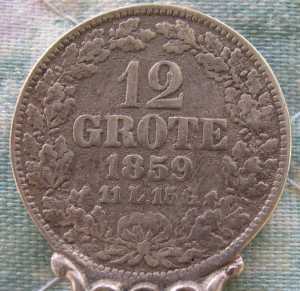 This small demi sized spoon has a finial 6 grote coin from Bremer dated 1861. 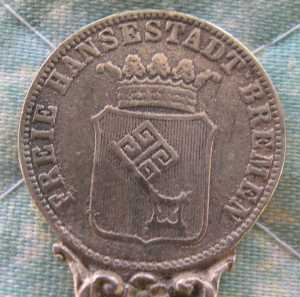 This is a 1/3 Taler Prussian coin from the era of Frederick the Great struck at the mint in Breslau and is dated 1773. Note: this is a .666 fine silver coin that has been gold washed. 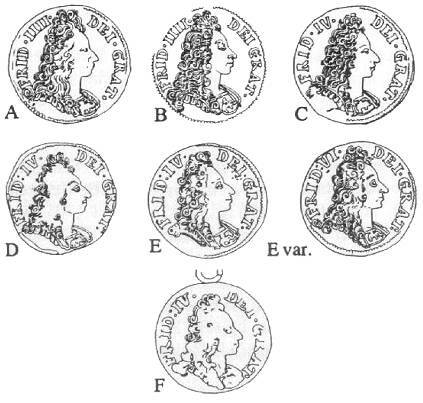 In 1750 the quality and size of these coins was reduced. 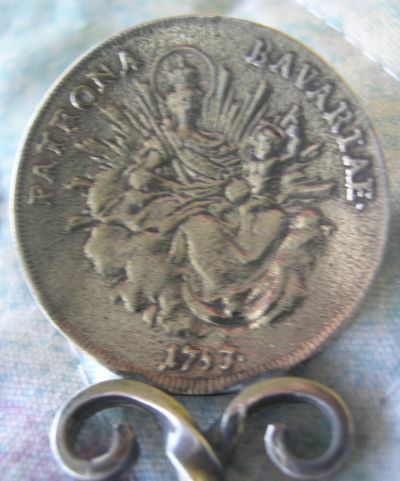 The monetary agreement between Austria and Bavaria in 1753 began the period of the Conventionsthaler, a Thaler set at 10 to equal one Cologne Mark of silver. Its weight was 28.0g with a fineness of 833.0. Over time this coin spread into a large portion of central and southern Germany. The full maned standing lion at the finial of this spoon is cast and is very heavy. The lion is used on the coat of arms of Bavaria.